Enter this year's smile makeover competition. Click the button below, fill in your name and email address and you can be the lucky winner! Enter the Draw for a €20,000 Smile Makeover! We’re celebrating our tenth year providing dental care to people around Ireland with a full smile makeover giveaway! With over 12 dentists and specialists on-site, we’ll be giving you the best treatment available, all under one roof. You’ll be in the hands of cosmetic experts who will care for your dental health and use all that modern dentistry has to offer to craft you a beautiful natural-looking smile. We’ve helped others overcome their phobia of the dentist and let them reclaim a healthy, natural smile. Your comfort is our top priority, so we use gentle treatment and comfortable surroundings so you can relax and look forward to the end result! Have you ever been afraid to laugh when you meet someone new? Have you ever covered your teeth in a photo. You never need to do that again. It's never been easier or quicker to achieve that beautiful smile you can be proud of. Even little changes can make all the difference. 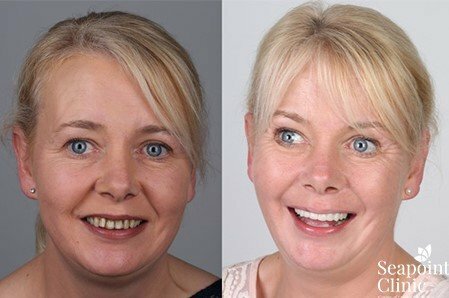 Here at Seapoint Clinic, we offer some of the world’s leading aesthetic dentists who are more than happy to help you regain your confident, natural smile. Are you looking for the best that modern dentistry can offer? Then experience the difference at Seapoint Clinic.